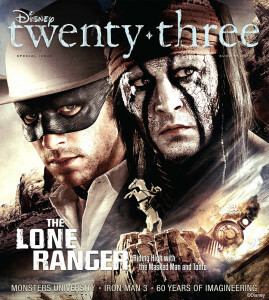 Disney twenty-three’s Spring issue also includes a look ahead at some of the latest entertainment coming from Disney. 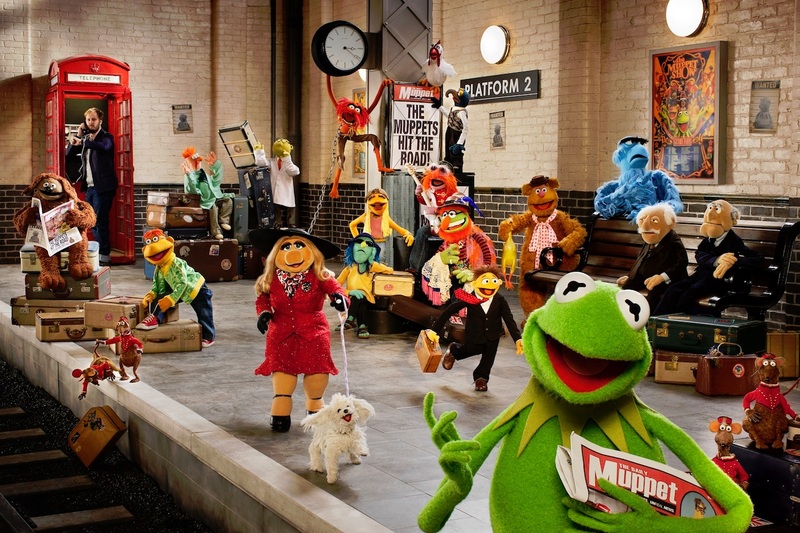 Ty Burrell, Tina Fey, Kermit the Frog, and Miss Piggy give readers a peek “behind the felt” at Muppets Most Wanted,which opens this March. Chris Evans talks about suiting up once again for April’s Captain America: The Winter Soldier.Plus, Jonathan Freeman discusses taking his characterization of the villainous Jafar from screen to stage, as Disney Theatrical Productions prepares to open Aladdin on Broadway this March. featuring locations used in Saving Mr. Banks. 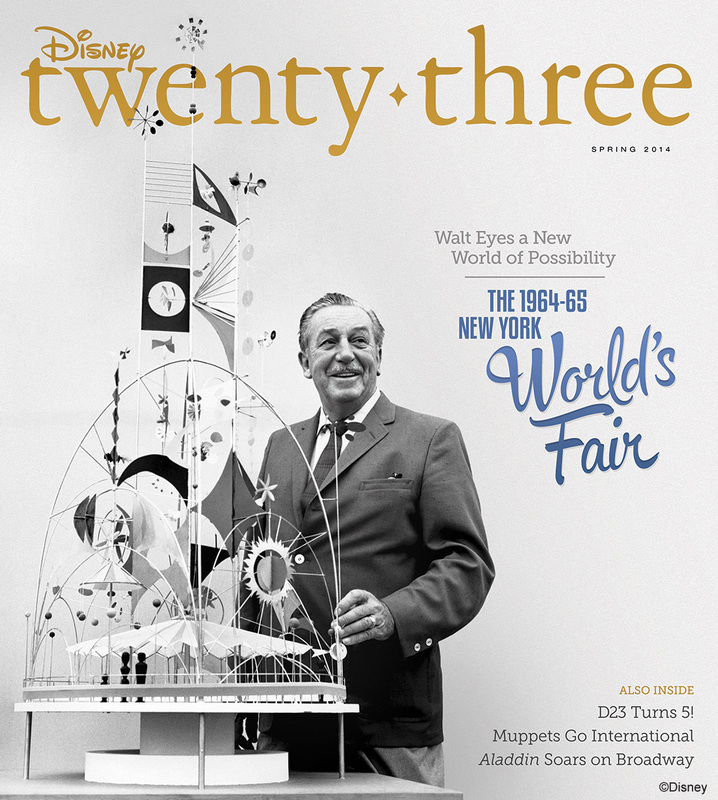 To celebrate the release of Saving Mr. Banks and the upcoming 50th anniversary of Mary Poppins, D23: The Official Disney Fan Club has dedicated the entire winter issue of its flagship magazine, Disney twenty-three, to our beloved nanny. 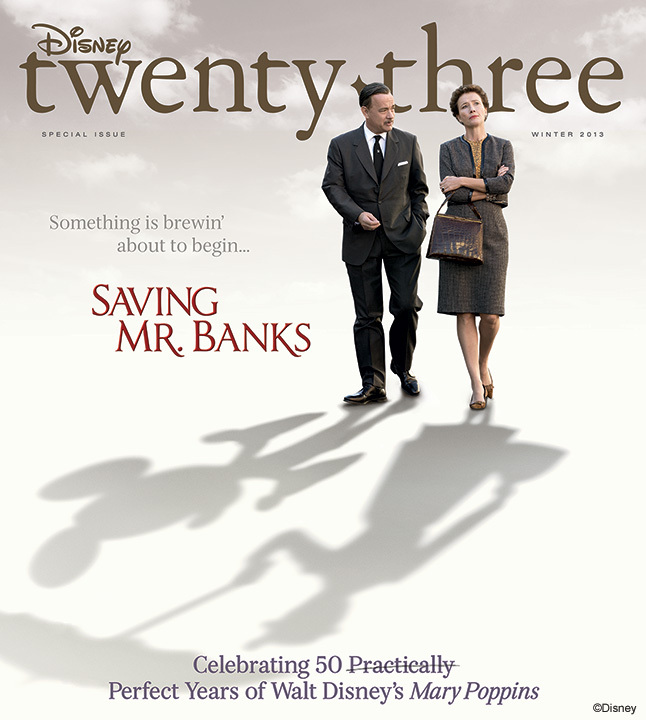 The publication, available exclusively to Gold Members of D23, includes exclusive interviews with Saving Mr. Banks stars Tom Hanks, Emma Thompson, and Bradley Whitford, as well as director John Lee Hancock. It takes readers behind the scenes of the making of this spectacular new film, which opens this Christmas and looks at the creation of Disney’s Mary Poppins and the sometimes combative but respectful relationship between the character’s creator, P.L. Travers (Thompson), and Walt Disney (Hanks). 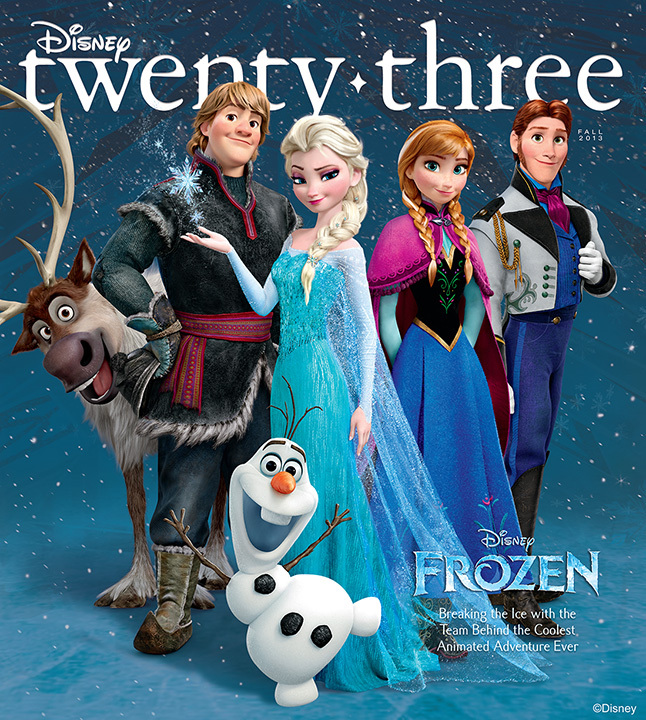 Disney twenty-three’s Winter issue also offers a look inside the fascinating life of P.L. Travers, with a personal reminiscence by her friend, author Brian Sibley, whom she once told, “I don’t feel for a moment that I invented her. I feel visited by her.” And original film composer Richard M. Sherman, visual consultant Tony Walton, and choreographers Marc Beaux and Dee Dee Wood offer exclusive insight into the creation of the 1964 Disney classic, which will officially celebrate its 50th anniversary next August. All D23 Members are invited to visit www.D23.com, where the fan club is kicking off its year-long celebration of Mary Poppins’ 50th anniversary with a unique video reconstruction of the Mary Poppins world premiere, containing five minutes of never-before-released material. Although the original telecast of the event appears to have been lost forever, this 22-minute segment includes audio from the premiere’s two separate interview locations, combined with all the surviving color film and black-and-white newsreel footage—re-creating the excitement and glamour of this stellar premiere at Grauman’s Chinese Theatre on August 27, 1964. Extensive Mary Poppins galleries, including a look at the film’s breathtaking matte paintings. Also in the Winter issue, D23 Gold Members will receive a reproduction of the ticket mailed to invitees for the Mary Poppins premiere at Grauman’s Chinese Theatre. 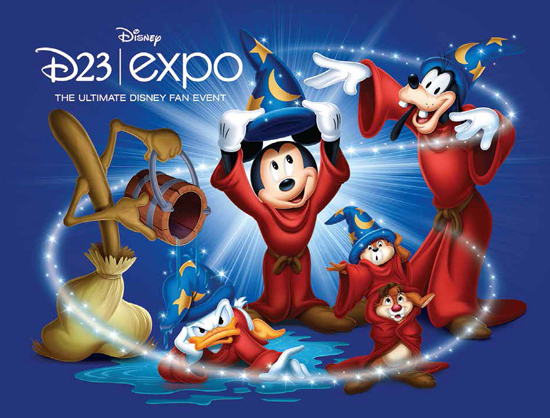 More Great D23 Expo Information! Exclusively at Disney’s D23 Expo August 9–11 at the Anaheim Convention Center, Disney fans are invited to explore the incredible roster of film, stage, and music projects on the horizon at The Walt Disney Studios, with a variety of panel discussions, sneak peeks, and exhibits. Author ShelleyPosted on July 29, 2013 July 29, 2013 Categories D23, ExpoTags California, d23, D23 Expo, Disney D23, ExpoLeave a comment on More Great D23 Expo Information! Dr. Doofenshmirtz is primed to take over Disney’s D23 Expo…and the Tri-State Area with his most wacky “-inator” yet — “The Waffle-inator” — a spectacular 40-foot high interactive game, combining physical and digital worlds — and simulated waffles — in an epic showdown to free Agent P from the clutches of Dr. Doofenshmirtz. Kids, tweens and families can hop aboard and wield the life-size invention to play “The Phineas and Ferb Waffle-inator Challenge,” over three days at Disney’s D23 Expo, the ultimate event for Disney fans, at the Anaheim Convention Center FRIDAY, AUGUST 9–SUNDAY, AUGUST 11. The Waffle-inator is depicted in “Phineas and Ferb: Mission Marvel,” the highly anticipated event episode of the #1 animated series for kids and tweens, premiering FRIDAY, AUGUST 16 (8:00 p.m., ET/PT) on Disney Channel and SUNDAY, AUGUST 25 (10:00 a.m. ET/PT) on Disney XD. In the storyline, Phineas and Ferb, team up with the Marvel Super Heroes to help them regain their powers and defeat Marvel Super Villains and Dr. Doofenshmirtz, in an epic battle of good versus evil, where the dastardly delicious device “The Waffle-inator” comes into play. Stars from Marvel Universe – Adrian Pasdar, Drake Bell, Fred Tatasciore, Roger Craig Smith, Bumper Robinson and Laura Bailey – will join the line-up of stars across Disney Channel, Disney XD and Disney Junior who will meet fans at Disney’s D23 Expo, including “Teen Beach Movie,” “Phineas and Ferb,” “Shake It Up,” “Jessie,” “Gravity Falls,” “Good Luck Charlie,” “Liv and Maddie,” “Kickin’ It,” “Dog With A Blog,” “Lab Rats,” “Crash & Bernstein,” “Wander Over Yonder” and “Sofia the First.” Fans can also catch live performances from Hollywood Records’ recording artists Bridgit Mendler and R5 featuring Ross Lynch, and meet favorite characters Princess Sofia (“Sofia the First”), Doc McStuffins, Jake (“Jake and the Never Land Pirates”), Spider-Man and Iron Man. To play the “The Phineas and Ferb Waffle-inator Challenge,” fans are invited to man one of four colorful, full-scale “Waffe-inators” to unleash flying foam waffles and to move Phineas and Ferb up a towering screen, while outmaneuvering Dr. Doof’s evil creations, to free a trapped Agent P before time runs out. “The Phineas and Ferb Waffle-inator Challenge” will be located in the Grand Plaza near the D23 Expo entrance for fans to enjoy Friday, Saturday and Sunday from 9:00 a.m. – 5:00 p.m.
Disney Channels Worldwide is a portfolio of over 100 kid-driven, family inclusive entertainment channels and/or channel feeds available in 166 countries in 34 languages, spanning Disney Channel, Disney XD, Disney Junior, Disney Cinemagic, Hungama and Radio Disney brands. Through cable, satellite and digital terrestrial television channels and a strategic partnership with Disney-ABC-ESPN Television for the third-party distribution of Disney-branded kids’ programming across the globe, Disney Channels Worldwide reaches hundreds of millions of viewers. Disney Channel properties continue to rapidly expand into new markets across the world, playing a key role in introducing the Disney brand to new consumers. 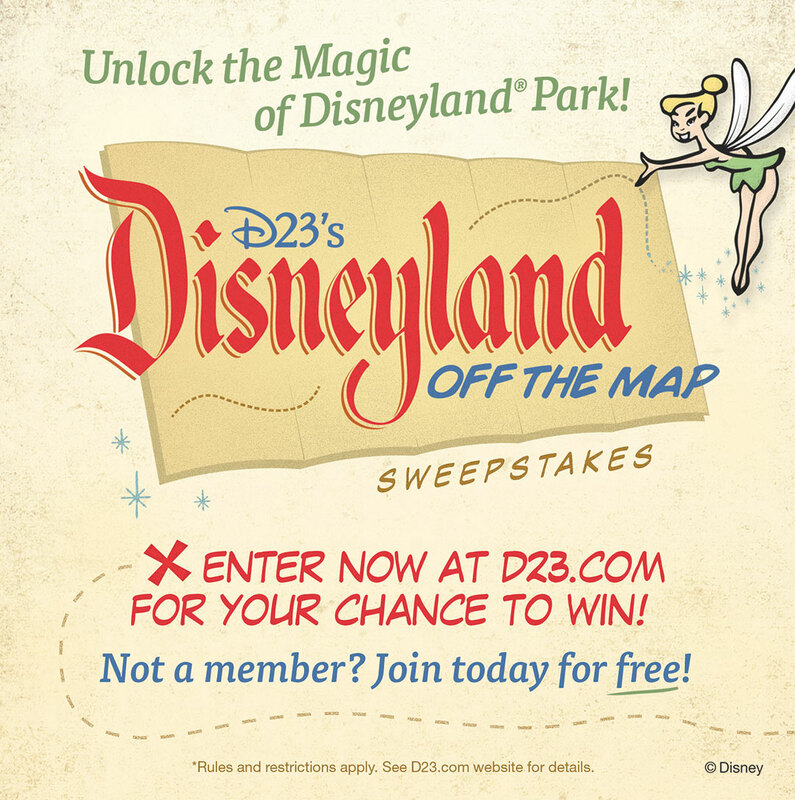 D23 Members Can Go “Off The Map” At Disneyland! Walt Disney’s private apartment: Built during the initial construction of Disneyland, Walt Disney’s private apartment is a quaint studio dwelling, filled with Victorian decor, family photos, and antiques selected by the Disney family. Lilly Belle VIP parlor car: Disneyland guests have long taken grand circle tours on the Disneyland Railroad, but few ever enjoy the ride from the elegant Lilly Belle VIP car parlor. Named after Walt’s wife, Lillian, the Lilly Belle is truly a piece of history, built in 1955, and refurbished to its modern state of luxury for America’s bicentennial celebration in 1976. Disneyland Dream Suite: This private space above Pirates of the Caribbean was originally planned to be another apartment for Walt Disney, but he passed away before its completion. In 2008, Imagineers used some of Walt’s original ideas and some truly magical surprises of their own to transform it into a fantasy villa like no other. Fans can join D23 for free at D23.com and at www.DisneyStore.com/D23. To keep up with all the latest D23 news and events, follow us @DisneyD23 on Twitter, Facebook, Pinterest, and YouTube. Author NewsPosted on July 19, 2013 July 19, 2013 Categories D23Tags California, d23, Disney D23, Disneyland, Off the Map SweepstakesLeave a comment on D23 Members Can Go “Off The Map” At Disneyland! Disney Consumer Products (DCP) will give Disney’s most loyal fans an up close look at an extensive collection of interactive experiences and merchandise that celebrate Disney, Marvel and Star Wars timeless characters during the bi-annual D23 Expo, the ultimate Disney fan event. Held at the Anaheim Convention Center from Aug. 9-11, 2013, Disney fans will have the chance to follow their favorite products from “sketch to shelf” and learn how Disney Consumer Products extends storytelling from character and content extension to product development through featured discussions, art and sculptures and final product displays. While at the D23 Expo fans will also be able to immerse themselves in exhibits, hands-on demonstrations, special signing opportunities and exclusive product offerings at the Disney Consumer Products Pavilion. Disney Princess Ariel-Themed Sephora Pop-up Shop – Sephora Pro artists and manicurists will give attendees the royal treatment with products from the Disney Ariel Collection by Sephora. The collection will be available for purchase along with an exclusive-to-D23 Expo-only Swarovski crystal-encrusted Ariel compact mirror. Attendees will receive starfish hair clips with every complimentary beauty service each day, while supplies last. Steamboat Willie Redux – Celebrate the history and timelessness of the most cherished Disney character through this graphically re-interpreted mash-up of the pioneering 1928 cartoon short, Steamboat Willie. Spider-Man’s Ultimate Innovation – Come check out products on the cutting edge of product innovation and design featuring one of the most popular Super Heroes in the world, Spider-Man, in Marvel’s first-ever appearance in the DCP showcase at the D23 Expo. Star Wars at D23 Expo! – For the first time at the D23 Expo Star Wars fans can have access to experiences created for them by Lucasfilm and Disney. Darth Vader: The Evolution of a Villain, located in the DCP pavilion, showcases the development of the iconic villain from early concepts to striking realization. Crash Course in the Force: Star Wars Saga 101, presented by Lucasfilm’s resident authority Pablo Hidalgo at Stage 23, will give Star Wars newbies and experts alike a thorough grounding in all matters of the Force and the Star Wars legacy. Fans will have the opportunity to participate in other immersive experiences, including: Find Your Voice with The Little Mermaid, a karaoke experience celebrating the music from the film; Journey through the Art of Tink, a gallery where Disney artists, designers, illustrators, and animators from around the world have re-imagined our magical, sassy and feisty fairy, Tinker Bell; What Makes a Puppet a Muppet?, which will help fans learn what it takes to create a Muppets “plush” and then create your own; Take a Ride with Disney•Pixar’s World of Cars and Disney’s Planes, which explains how the highly collectible diecast vehicles are made; Assembling The Avengers Franchise, an exclusive tour through the history of The Avengers and the chance to see the latest The Avengers products; and I heart Mickey & Minnie, a rarely seen collection of beloved Mickey Mouse toys, apparel, and accessories from past decades, along with a showcase of Minnie Mouse-inspired fashions from around the globe. D23 Members attending the Expo are invited to attend the Disney Store signature store opening ceremony to “Unlock Imagination”, each morning at 9 a.m. at the Convention Center, when the D23 Expo floor opens for members. The 1,800-square-foot Disney Store retail space will be packed with the latest D23 Expo merchandise created by Disney Store and will feature guest artist signings. In addition, guests will find an array of products not yet available to the public, including a Disney∙Pixar capsule collection, which will bring together multiple characters from Disney∙Pixar’s cherished portfolio of films for the first time ever. Disney Publishing will take fans into the world of books, apps and everything in between by showcasing how artists, storytelling and innovative content combined creates stories full of magic and adventure. Guests can participate in live readings with Fairy Godmother on Friday, watch artists behind popular Disney stories sketch live on Saturday and get their hair styled like a Disney Princess by Sephora on Sunday with the help of the Disney Princess Royal Salon app. New books and never-before-seen lithographs featuring Peter Pan, Mickey Mouse and Sleeping Beauty will be available for sale inside the booth. Ridley Pearson and The Kingdom Keepers Insider App Quest – New York Times best-selling author Ridley Pearson embarks on a journey to write the seventh and final book in the Kingdom Keepers series—only this time, his readers are helping him write it! Join the author as he reveals how deception and betrayal rock the Kingdom Keepers’ world as the merciless group of Overtakers (Disney villains) stage an unexpected comeback (Presentation: Friday, Aug. 9 – 12 p.m.-1 p.m. Signing: 1:15 p.m. – 2:15 p.m., Talent Round Up). Dave Bossert Remembers Roy E. Disney with special guest Roy P. Disney – Dave Bossert and Roy P. Disney will share stories, drawings and candid photos found in Bossert’s new book Remembering Roy E. Disney: Memories and Photos of a Storied Life (Presentation: Friday, Aug. 9 – 1:30 p.m.-2:30 p.m. Signing: 2:45 – 3:45, The Dream Store). Disney Imagineering Legend Marty Sklar Presents…Dream It! Do It! : My Half-Century Creating Disney’s Magic Kingdoms – Disney Legend Marty Sklar will take guests through a presentation based on his new memoir—one that recounts his epic Disney adventure, including working as Walt’s literary right-hand man for the Disney Parks, writing a film expressing Walt’s philosophy for the Walt Disney World project and Epcot and opening nine of the 11 Disney parks around the world (Presentation: Friday, Aug. 9 – 3 p.m.-4 p.m. Signing: 4:15 p.m. – 5:30 p.m., Talent Round Up). The name “D23” pays homage to the exciting journey that began in 1923 when Walt Disney opened his fledgling studio in Hollywood. D23 is the first official club for fans in Disney’s nearly 90-year history. D23 gives its members a greater connection to the entire world of Disney by placing them in the middle of the magic through its quarterly publication Disney twenty-three; a rich website at D23.com; and member-exclusive discounts and special events for D23 Members throughout the year, highlighted by the D23 Expo in Anaheim, California, August 9–11, 2013. Disney Consumer Products (DCP) is the business segment of The Walt Disney Company (NYSE:DIS) that delivers innovative and engaging product experiences across thousands of categories from toys and apparel to books and fine art. As the world’s largest licensor, DCP inspires the imaginations of people around the world by bringing the magic of Disney into consumers’ homes with products they can enjoy year-round. DCP is comprised of three business units: Licensing, Publishing and Disney Store. The Licensing business is aligned around five strategic brand priorities: Disney Media, Classics & Entertainment, Disney & Pixar Animation Studios, Disney Princess & Disney Fairies, Lucasfilm and Marvel. Disney Publishing Worldwide (DPW) is the world’s largest publisher of children’s books, magazines, and digital products and also includes an English language learning business, consisting of more than 40 Disney English learning centers across China and a supplemental learning book program. DPW’s growing library of digital products includes best-selling eBook titles and original apps that leverage Disney content in innovative ways. The Disney Store retail chain operates across North America, Europe, and Japan with more than 350 stores worldwide and is known for providing consumers with high-quality, unique products. 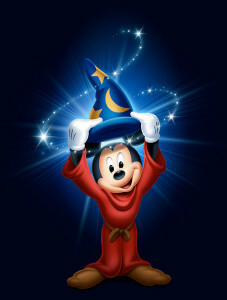 Disney’s official shopping portals online are www.DisneyStore.com and www.DisneyStore.co.uk. For more information, please visit Disney Consumer Products www.DisneyConsumerProducts.com or follow us at www.YouTube.com/DisneyLiving, www.Facebook.com/DisneyLiving, www.Twitter.com/DisneyLiving and http://www.Pinterest.com/DisneyLiving. The world of women’s sports was kicked upside down on July 10, 1999. Before a sold-out crowd of more than 90,000 at the Rose Bowl and an estimated 40 million Americans watching on television, the women’s soccer team reached a cultural and athletic pinnacle with its penalty kick shootout victory over China to win the Women’s World Cup. As part of ESPN Films’ new Nine for IX series, The ’99ers explores the story behind this incredible team. 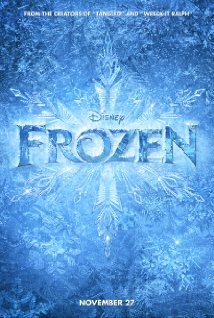 Attendees of the D23 Expo 2013 can catch an exclusive screening of this film featuring a Q&A with the director Erin Leyden and the producer Julie Foudy. The screening/ Q&A will take place at The Ultimate Disney Fan Event in Stage 28 at the Anaheim Convention Center on Sunday, August 11 at 2:30 p.m. PT. The ’99ers is told through the voice of Foudy, a longtime team captain, who gives viewers an inside look at the strong team ethic and rare “do for each other” mentality that propelled them to victory that day and turned the team into a cultural touchstone. With unprecedented access, the film uses candid, behind-the-scenes footage shot by the players themselves during the tournament to present a unique portrait of the women who irrevocably changed the face of women’s athletics. Reuniting key players from the 1999 squad and talking with current U.S. players as well, the film examines how women’s soccer – and women’s sports as a whole – has changed since that epic day at the Rose Bowl. The name “D23” pays homage to the exciting journey that began in 1923 when Walt Disney opened his fledgling studio in Hollywood. D23 is the first official club for fans in Disney’s nearly 90-year history. D23 gives its members a greater connection to the entire world of Disney by placing them in the middle of the magic through its quarterly publication Disney twenty-three; a rich website with members only content at D23.com; member-exclusive discounts and special events for D23 Members throughout the year, highlighted by the D23 Expo in Anaheim, California, August 9–11, 2013. The contest will be two (2) hours in length, and, therefore, the number of entrants is limited. Guests interested in participating MUST complete an entry from, available now at D23Expo.com. Closing date for entry is July 21. Not all applications for entry will be accepted. Applications will be evaluated on the merits of quality and quantity and selected at the producers’ discretion. 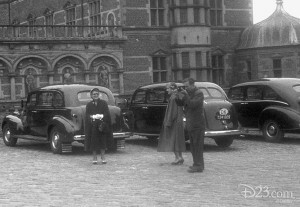 This never-before-released photo, taken with Walt’s personal camera, show Walt and his family visited Denmark in June 1951, where this photograph was taken. 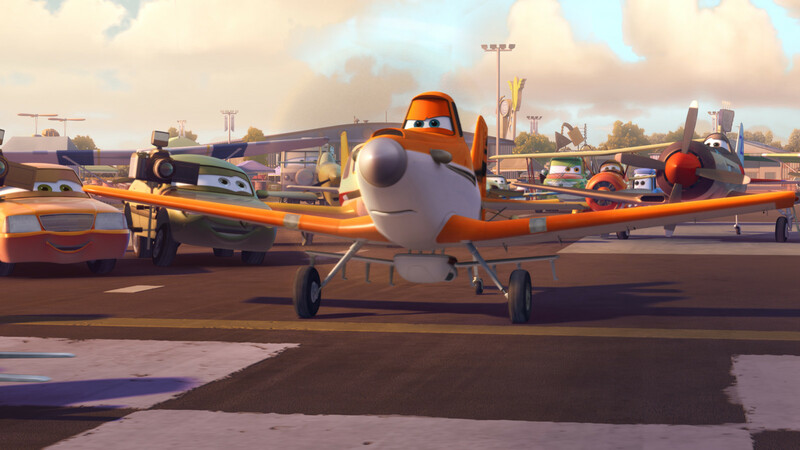 From the “D’scovered” feature exclusively on D23.com. D23: The Official Disney Fan Club relaunches their website with member-exclusive content and a new free level of membership. Many Disney fans have heard Walt Disney tell the story of how watching his daughter’s on the carousel at Griffith Parkin Los Angeles served as inspiration to build Disneyland. But images from that fateful day have never been shown to the public… Until today. D23: The Official Disney Fan Club is launching their reimagined website with thousands of pages of new content, including a story that features photographs of Walt’s daughters Diane and Sharon on the merry-go-round on that fateful day that ultimately changed how Americans — and people around the world — vacation. 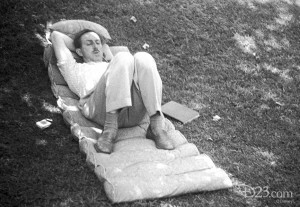 The Walt Disney Archives recently discovered rolls of film from Walt’s personal camera with hundreds of images, just a few of which are showcased today on D23.com in their new member-exclusive section. Other photos include a young Roy E. Disney on the same carousel, as well as candid moments from Walt’s life and travels around the world. Official D23 Expo Merchandise will allow Disney fans to take home a piece of the magic from this year’s expo, with an assortment of official D23 Expo inspired merchandise including tees, baseball cap, fleece, jewelry, drink ware, accessories, pins, and Vinylmation™. HARVEYS Seatbeltbags® are sure to make a statement at this year’s D23 Expo. This new collection which features Sorcerer Mickey, classic D’s and more on some of HARVEYS most popular silhouettes, were created especially for this year’s 2013 Expo. 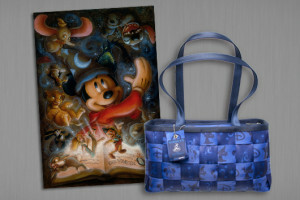 Disney Theme Park Merchandise will showcase some of its newest releases from Disney licensees and artists, including ACME Archives Limited, Dave Avanzino, Disney Design Group, Dooney & Bourke, Duffy the Disney Bear, Noah, Robert Olszewski, Precious Moments, Linda Rick, Jim Shore, and more. ACME Archives Limited invites guests to make the magic come alive in your home with the latest releases from Disney•Pixar, Disney Studio Art, Disney Limited, Disney Underground and more. Disney Design Group highlights a new Signature Collection of artwork including four captivating pieces filled with imagination, which bring to life Sorcerer Mickey and some of Disney’s most beloved characters. Disney Dream Collection and D23 Expo-Exclusive Jewelry will dazzle audiences with a sparkling new selection of fine jewelry debuting as part of this year’s D23 Expo and featuring classic Disney icons and characters like Mickey Mouse, Minnie Mouse and Tinker Bell, among others. Dream Store Autograph Sessions will give Disney fans the opportunity to meet and greet some of their favorite authors, artists, Disney Legends and other notable celebrities. Autograph sessions will be posted daily at the D23 Expo Dream Store. D23 Expo 2013 Silent Auction offers Disney enthusiasts the rare opportunity to bid on unique artifacts, artwork, experiences, props and more. 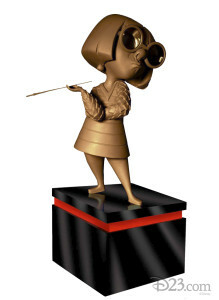 The D23 Expo 2013 Silent Auction takes place Saturday, August 10, 2013. 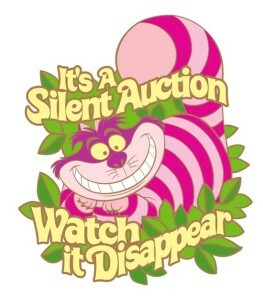 Tickets for the Silent Auction go on sale June 11, 2013, at 11:00 a.m. (Pacific) via www.ArtofDisneyParks.com. Separate D23 Expo admission is required. 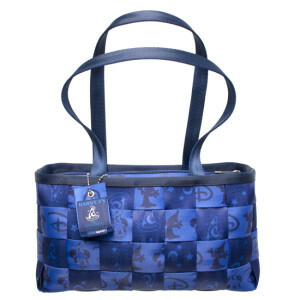 Please continue to watch as we release more details about Dream Store merchandise offerings, silent auction lots, and more on www.Disney.com/D23 and www.ArtofDisneyParks.com and on Facebook and Twitter at “DisneyD23”. The name “D23” pays homage to the exciting journey that began in 1923 when Walt Disney opened his fledgling studio in Hollywood. D23 is the first official club for fans in Disney’s 88-year history. D23 gives its members a greater connection to the entire world of Disney by placing them in the middle of the magic through its quarterly publication Disney twenty-three; a rich website at www.D23.com; member-exclusive discounts and special events for D23 Members throughout the year, highlighted by the D23 Expo in Anaheim, California, August 9-11, 2013. For one night only, two of the world’s most celebrated songwriters and composers will take to the stage for “Richard M. Sherman and Alan Menken: The Disney Songbook.” The concert will take place at the D23 Expo 2013 at the Anaheim Convention Center in the D23 Expo Arena on Saturday, August 10. 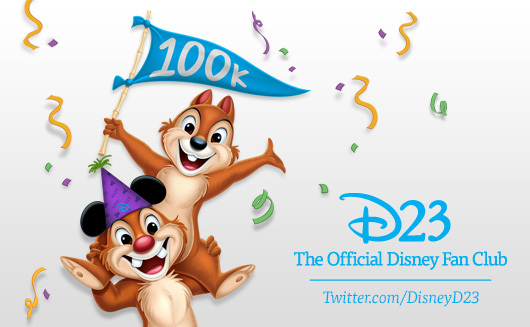 05.21.13 – To thank Disney fans for helping us reach this amazing milestone on Twitter, we are giving away Walt Disney Archives merchandise, D23 limited-edition t-shirts, and more in the new “#D23Swag” sweepstakes series. Starting on May 30th at 12:00 p.m., PT, we will send out a special message for our Twitter followers to “re-tweet.” You can re-tweet the message any time between when the message is originally sent from @DisneyD23 and 5:00 p.m., PT, that day. Those who re-tweet will automatically be entered into a randomized drawing to win cool D23 swag! For the full set of rules, click here. You’ll have a chance to participate every other Thursday after May 30 (don’t worry, we’ll remind you the day before so you don’t forget)! The sweepstakes series will include the following seven dates: May 30, June 13, June 27, July 11, July 25, August 8, and August 22. Prizes will include Walt Disney Archives merchandise, D23 limited-edition t-shirts, and more! Winners will be sent a Direct Message via Twitter to verify eligibility—so make sure you’re following @DisneyD23 on Twitter! 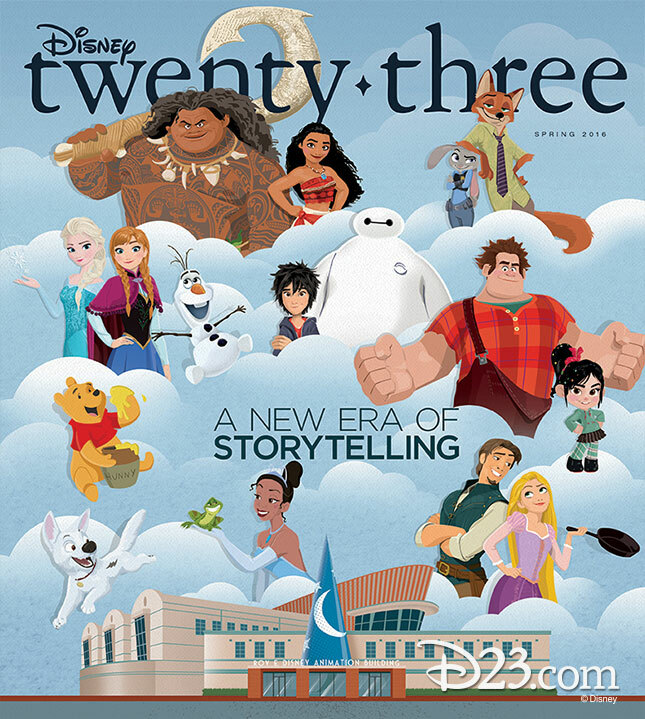 The summer issue of Disney twenty-three, the flagship magazine of D23: The Official Disney Fan Club, features a mega summer movie preview of Disney’s upcoming theatrical releases. D23 gets readers back in the saddle with filmmakers Jerry Bruckheimer and Gore Verbinski for Johnny Depp’s upcomingThe Lone Ranger; Billy Crystal talks about scaring up big laughs for Monsters University; the masterminds behind Marvel’s newest film, Iron Man 3, offer an inside look at how they’re bringing Iron Man back to basics; and John Lasseter shows us how the upcoming animated film Disney’s Planes will soar. 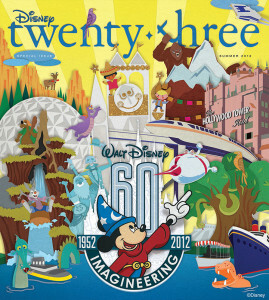 Disney twenty-three also celebrates 60 years of Walt Disney Imagineering with a special commemorative back cover. Imagineer Tony Baxter discusses his work on some of the world’s most iconic attractions, including Big Thunder Mountain Railroad, SplashMountain, and Star Tours. “You Do What?” profiles some of the most unusual jobs Imagineers have had over the years, from rock designer to castle architect. “Imagineering Fact? Or Fiction!” debunks some of the long-time myths and legends of the Disney Parks. And there’s much more, including “23 Imagineering Game Changers” and a salute from Chairman of Walt Disney Parks and Resorts Tom Staggs to the thousands of creative individuals whose contributions have changed the way guests experience Disney around the world.